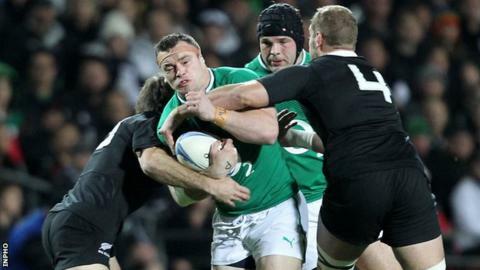 Ireland prop Cian Healy refuses to call New Zealand the All Blacks because the name puts the world champions "on a pedestal" and adds to their aura. Ireland have never beaten New Zealand and Healy believes they are already shrouded in too many myths. "I don't like the name the All Blacks," he said ahead of Sunday's game in Dublin. "I don't like putting any team on a pedestal. Former Ireland skipper Wiilie Anderson on his famous confrontation with New Zealand in 1989. "When you do that you find yourself below them already." In 109 years of trying, Ireland have never beaten New Zealand, losing 26 Tests with just one draw at Lansdowne Road in 1973. However, Healy insists that Ireland must not allow the acclaim heaped on the All Blacks, who could become the first side in the professional era to win every Test in a calendar year with victory in Dublin, to intimidate them at the Aviva Stadium. He said Ireland have no strategy on how to handle the Haka on Sunday, but added that he tries to play down its significance. "It's something I loved when I was a kid and something I hate now," Healy said. "People treat it in different ways, but it's going to be there so you have to just deal with it. "I don't draw inspiration from it. They are entitled to do it, it's part of their history and I'm certainly not saying they shouldn't." Healy believes Ireland have enough stars to compete with New Zealand, but said any chance of victory this weekend must be built around a team effort. "We look to do our own jobs," said Healy. "But it's do your own job so someone else is freed up to do theirs. "You always want to play the best teams and you always want to beat the best. You want to reach the top level and by doing that you have to beat all the best. "I think we're very close to getting everything right."